There’s so many things to tick off the list when you’re planning a wedding. Book the reception venue, buy the rings, find the perfect dress… oh, the dress! While these are a couple of the big things, there’s lots of tiny little details that will make your wedding uniquely you, from deciding on the way you’ll style your hair, all the way through to the jewellery and bridal hair pieces you’ll wear to accent the most beautiful dress you’ll ever wear. These little details can completely change the look of your dress on the day. Simple changes, such as choosing a flower crown over a tiara can make you feel so much more like yourself. I’ve seen how a lot of brides have really completed their wedding day look with accessories, so I thought I would share a few of my favourite styles, and the types of weddings they’re typically suited to. But, of course, it’s your wedding, so you make the rules! Tiaras aren’t only for the princess brides! No longer just for beauty queens, modern day interpretations bring sparkle and glamour to a traditional wedding dress. The bridal headband can also be a modern take, styled along the hairline. I love seeing brides with crystals and rhinestones in their hair against stunning urban backdrops or bringing a touch of intricacy to barnyard settings. Tiaras are especially gorgeous because they work with both up-dos and long, loose curls. If you’re a boho bride, planning a beach wedding, or love the idea of entwining your hair with flowers just because, the flower crown is the perfect wedding accessory. Flower crowns don’t just have to be large and colourful – I love the idea of using silk flowers or lace from your dress to create an heirloom piece you can hand down to your daughter. Bohemian headpieces can feature crystals, rhinestone and pearls, in additional to silk flowers, making them a real statement that everyone will be talking about! Probably the most versatile of all wedding accessories, adding a hair comb can be as simple as adding some accent touches or as grand and ornate as you like. Whether you’re planning an intimate affair in the countryside or something more glamorous, a bridal hair comb could be made from large silk flowers, rhinestones, crystals, pearls, lace – as much or as little as you like! The beautiful benefit of the hair comb is that you can create a piece to match almost any hairstyle… from the delicately ornate to loose and flowy. Bridal hair pieces such as combs allow brides to add a touch of sparkle, in their own way. Veils are typically seen on the more traditional bride but there are so many different styles to choose from. Changing the length of your veil can make a big difference to your overall look. Cathedral length veils are perfect for church weddings and look so stunning when edged in lace. Whereas birdcage veils work beautifully for a more timeless and vintage look. Short veils are a little more modern, and don’t forget that you can add a personalised touch to your veil by pairing it with pretty silk hair flowers or a bridal comb. You’ll also be taking your veil off after the ceremony so don’t forget to consider what you’ll wear in your hair for the reception. Pairing your veil with a simple headpiece looks beautiful. And it means your hair will still look finished until the night is over. 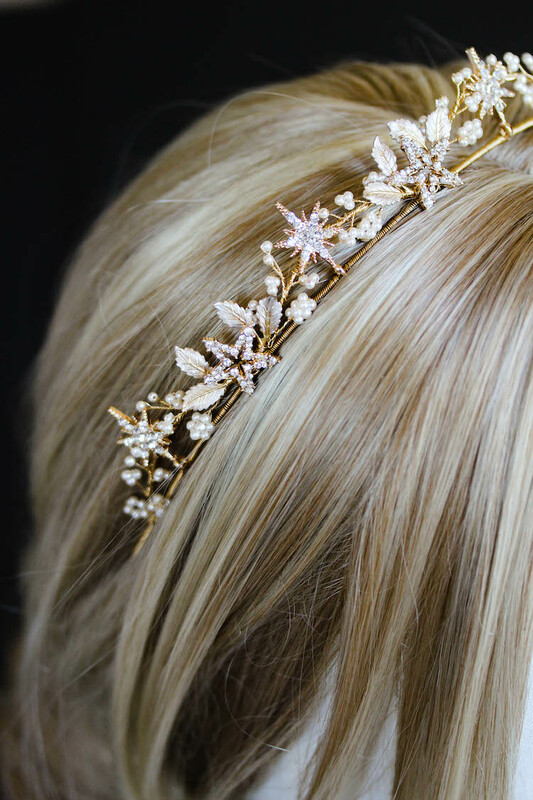 Bridal hair pieces and wedding accessories are the perfect way to capture you and your incredible style. I can’t think of a more beautiful way to express those tiny touches that make a wedding unique. If you love the idea of creating something utterly ‘you’, a bespoke wedding hair piece might be just the thing for you. Feel free to send me an email, let’s chat!